*You are advised to bring boots to the festival since we may have very wet and muddy trails. Field Trips to Presque Isle's Hottest Birding Spots. 12 - 15 people per trip. Birds and Beans coffee and light breakfast served 6.30am-10.30am at the Rotary Pavilion. Be kind to the environment: remember to bring your own mug. ​from 6:30 am - 10:30 am at the Rotary Pavilion. Each trip will visit multiple locations throughout the park. Nic Allen is a dental student and recent transplant from Florida. His interest in birding began with an ornithology class during college and since then birding has consumed much of his free time outside of school in both Florida and now in Pennsylvania. Katie Andersen has been interested in birds since birth. She holds a B.S. in Biology and studied neo- tropical ornithology as well as other research projects in Pennsylvania. Katie is the Store Naturalist at Wild Birds Unlimited-Erie. Diane Baillargeon is a Certified Pharmacy Technician and has been an avid birder for more than 20 years. 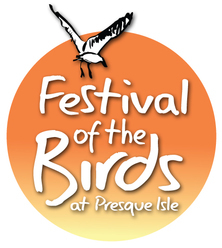 Attending the Presque Isle Birding Festival for the past years has introduced her to the challenge of warblers and that sharing the love of birding with others is very rewarding. Mary Birdsong is co-founder and Assistant Director at the Erie Bird Observatory. She serves as and a seasonal shorebird monitor at the park April through August. She is also a freelance writer and artist. She serves as Program Chair for PIAS. Julie Dell has been a birder for 35 years. She is currently serving as Treasurer for Presque Isle Audubon. She has been Purple Martin Landlord for 5 years, and is a longtime volunteer member of the Piping Plover Conversation Team. Roger Donn is part of the International Shorebird Survey team monitoring shorebirds at Gull Point and assists with Presque Isle Hawk Watch and the water bird count. One of his passions is finding Northern Saw-whet Owls and Long-eared Owls at Presque Isle State Park. Jennifer Ferrick has been working within arms reach of birds, currently holding the position of Office Manager at Tamarack Wildlife Center. As an avid conservationist, some of the groups she has worked with include the Pennsylvania Game Commission, National and Pennsylvania Audubon Society and Erie Bird Observatory. Michele Franz is a speech language pathologist. She is an active birder and accomplished bird photographer. She has served as president and education chair of PIA, and is currently field trip chair. Barbara Gillis is an RN and started birding as a child in Lockport NY. She has worked to make her yard birder friendly and has introduced others to birding and continues to widen her knowledge of birds and seeks out the thrill of seeing a new bird for the rst time. Bonnie Ginader has been birding for more than 40 years and she has spoken to many garden clubs about birds. She did two displays at the Stull Center when it opened and funds bird seed for the feeders at the ranger station on the park. James R. Hill, III, (aka “Jamie)” is the founder and Executive Director Emeritus of the Purple Martin Conservation Association. He has also worked for both the Cornell Lab of Ornithology and Auburn University in Ivory-billed Woodpecker searches. In the Galapagos Islands he dug for fossil Darwin Finch bones in underground lava tubes and in Brazil to study the winter roosting habits of Purple Martins, and has birded all over the New World. Pat Howell is a retired teacher who has been birding for 30 years. She does IBA bird counts at Roderick State Game Lands, is a volunteer for the Breeding Bird Atlas and helps monitor nesting bluebirds at TREC. She loves birding at her home, which is along the shore of Lake Erie and regularly birds with friends on Presque Isle. Her love of birds has led her to trips in the USA, and around the world. Laura-Marie Koitsch is co-founder and Assistant Director, Research, of the Erie Bird Observatory. She has more than 10 years experience working with birds on several continents and this year marks her fourth spring migration as the Bander-in-Charge here in the park. Prior to becoming an avian researcher, she worked in wildlife rehabilitation. She holds an international law degree. Mark Lethaby is collections manager of the Natural History Museum at the Tom Ridge Environmental Center and works as a biologist aide for the PA Fish and Boat Commission. His primary interests are in reptiles and amphibians, and he is a long-time member of Presque Isle Audubon. Jason Lymangrover is a mechanical engineer and a long-time outdoor enthusiast. He found his interest in birding through hunting and photography and now spends most of his free time outdoors birding. Kathy Lutton became a member of the Audubon Society when she saw Birds and Blooms magazine changing from people and weddings to friendlier more interesting nature and bird photography. Joining Audubon has changed how she views things and she wants to share what she learns with others to make a better world. She enjoys her grandchildren, birding, hiking, photography and stargazing. Jared McGary graduated from Slippery Rock University with a degree in Park and Recreation. He does most of his birding while hunting or taking walks with his wife. Jared started birding at a young age while hunting with his father. Liz McQuaid has been birding the Cleveland area most of her life, but got serious in 1992. She is part of the team to prove the Cleveland Lakefront Nature Preserve an Important Bird Area, is co-advisor for the NE Chapter of the Ohio Young Birder’s Club, volunteers with the Western Cuyahoga Audubon Society, the Big- gest Week, the Kirtland Bird Club and Lights Out Cleveland. Jerry McWilliams is senior author of the book, The Birds of Pennsylvania and co-author of the book, Birds of Erie County, Pennsylvania. He is also regional editor for the journal, Pennsylvania Birds and sub-regional editor for the journal, North American Birds. Mike Plyler has been a lifelong camping and hiking enthusiast and has been birding since 2001. He is a former PIAS trustee and a regular volunteer. Emily Pritchard earned a degree in Park and Resource Management from Slippery Rock University. She is employed as an Environmental Education Specialist for Pennsylvania State Parks, where she enjoys sharing her love for the natural world through teaching. She enjoys hiking, visiting local farm stands and travelling to National Parks. Sarah Sargent is a co-founder and Executive Director of the Erie Bird Observatory. She has more than thirty years experience working with birds and for the past 10 years, she has overseen avian research projects throughout Northwestern Pennsylvania. Susan A. Smith’s interest in birds ignited with her first Field Guide of the Birds of North America. It took her awhile to learn that she shouldn’t look for a Vermillion Flycatcher in Erie! She does birding programs, eld trips and writes articles about birding. Donald Snyder is a Professor Emeritus, Dept. of Biology at Edinboro University of Pa., where he taught for 27 years. He has been a birder all of his life, a member of PIAS for more than forty years and has served as Christmas Count Compiler, Bird Records Committee Chair and Vice President. Sam Stull’s interest in birds began as a child, and he has spent many happy hours watching and studying birds at Presque Isle and elsewhere. He also enjoys photography. Joao Tavares is a semi-retired orthopedic surgeon and an active member of PIAS. He was introduced to bird watching by Jerry McWilliams more than 14 years ago and enjoys Presque Isle Park and all its birds year-round. Shannon Thompson has been a lifelong outdoor enthusiast but became highly distracted by birds in 2007. She now devotes most of her free time to birding around Pennsylvania. Presque Isle is her most favorite place to go bird watching. Andrew Troyer loves bird watching and managed a bluebird trail for over 40 years. He has been caring for the Purple Martins for over 25 years. The PMCA has banded over 9,000 of his chicks here in the past 25 years. He has just released his latest book, A Purple Martin’s Journey, Getting to Know and Care for the Purple Martins.